I noticed that the Rose Hips along our driveway were already red and many have already dried up and died. So I took a quick walk down the driveway to harvest what remaining Rose Hips I could find. It may not look like much but I was glad to be able to pick some before they were all gone for the season. Usually I harvest the Rose Hip berries later in the Fall like September or October. But this year, it appears with all the heat and lack of moisture, they dried up and fell off their branches early. As few months ago I wrote a Rose Hips post on how to identify Rose Hips growing in the wild along with pictures to help in recognizing the plants. 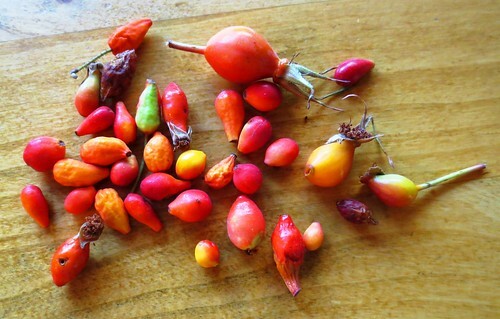 There are several different varieties of wild Rose Hips. You can see in the photo above that I have a few different types of berries growing in my area. I will cut off the leather skins and remove the insides. Remember to always remove the skins from the seeds and other materials inside. The seeds and little fibers inside are an irritating, hairy-looking substance you do not want. You need to remove all of the insides and rinse the red skins thoroughly to remove this unwanted material before you can use the remaining valuable portion of Rose Hip berry.